Certain types of post-surgical bandaging techniques can be made as removable harness and sling systems. Devices are made with fabric, neoprene, dacron webbing & velcro. 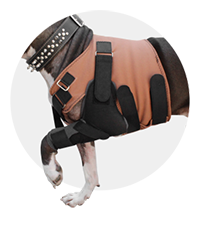 As with any custom device, these slings need to be made with the dog present at PawsAbility.